The 1/8 - 1/2" long galls produced by the fly appear white due to a covering of fine, powdery material. Rubbing the powder off reveals the gall's true light green color. 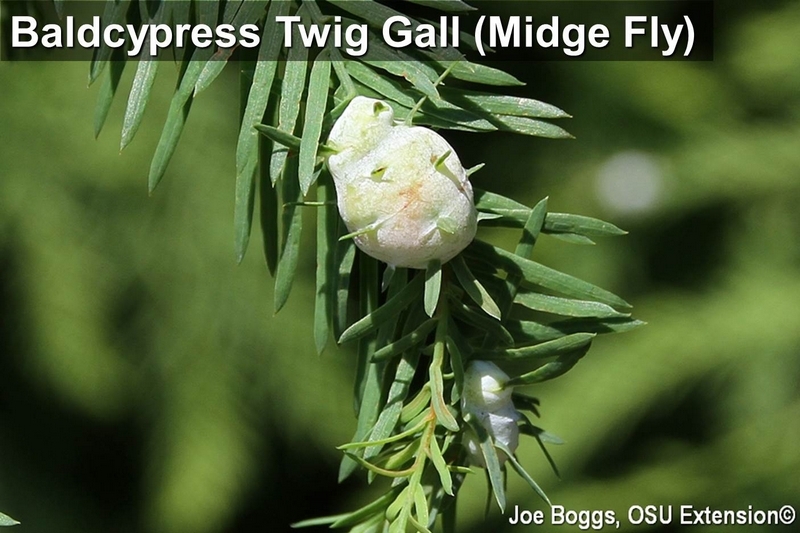 The common name "twig gall" is technically inaccurate since these are not stem galls; they arise from the base of leaflets. Indeed, needles extend through the galls to protrude beyond the gall surface and a portion of this season's leaf growth usually extends beyond the tips of the galls. Opening the galls will reveal multiple midge fly larval chambers with each containing a tiny, orangish-yellow midge fly larvae (maggots) that directed gall formation. Each maggot is individually housed in its own tiny compartment. Once maggots pupate, and a new set of adults emerge, the galls will eventually shrivel and detach from the trees. At around this time, the leaflet growth extending beyond the gall will sometimes die and turn reddish brown producing an unsightly appearance. Adult flies emerge from the fallen galls on the ground. The flies have two generations per year with the current galls housing the first generation. Although the galls and eventual browned-tipped foliage may reduce the aesthetic appeal of infested trees, the flies appear to cause no appreciable harm to the health of the tree. Populations are often regulated by a wide range of parasitoids that target the maggots. Therefore, insecticide applications are not recommended. Pruning and destroying galls now on small trees will reduce the number of second generation galls.